Concrete won. On Wednesday afternoon Luke and Gibi were playing outside when Luke took a major tumble off the sidewalk onto the street (well, the culdesac, not really the street... but pavement nonetheless). Gibi told me that it looked REALLY bad, but when I got home and saw this I really wanted to cry! It looks SO painful! I don't have any of the actual pictures to show you, but here are a few I snapped of Mr. Man before he headed into the studio. The feature article this month is about Cowboy themed birthday parties which is why he's dressed western. Oh my gosh!!!! Poor Baby!!!!!! 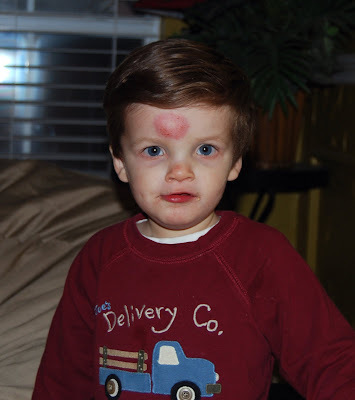 Carter's face met the pavement this week too, but it doesn't look nearly as painful as Luke's head looks. SO exciting about the cover shoot!!!! What month is it for? I can hardly wait to see it!